Please add $12.00 for shipping, handling, & insurance. This 10" x 8" image is double matted, with a light beige top mat. This 13.75" x 10.375" image is double matted, with a light beige top mat. This print is hand-signed by the artist. Please add $15.00 for shipping, handling, & insurance. Kissing the Face of God is one of Morgan Weistling's popular images, a portrait of light and love with universal appeal. "This painting was first inspired by the phrase 'kissing the face of God,' which I heard in a song many years ago. I started to contemplate the awesome privilege that Mary was given, being able to hold God in her arms, but also keeping in mind that He was still her baby. I immediately thought of a composition with Mary and baby Jesus and how Mary had the privilege to hold God in the flesh in her arms. She cuddled and kissed him just as all mothers do with their babies. This thought propelled me right into this painting which I wanted to be a very human representation of divinity. My prayer is that the viewer will be struck, as I am, with the amazing way that God chose to send His Son into this world — in pure humility." 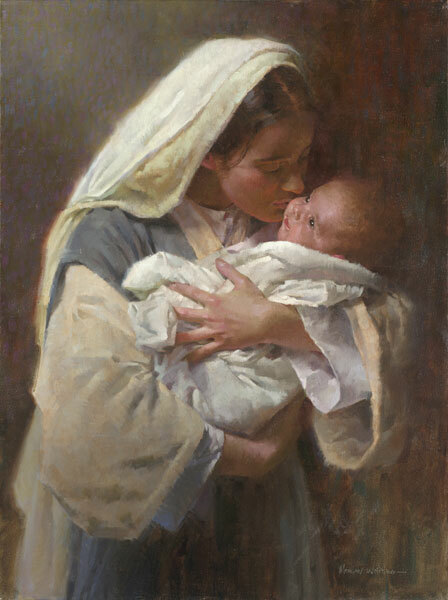 Kissing the Face of God copyright© 1998 by Morgan Weistling.